It all began on an afternoon when I had to start making dinner before Terry got home from work. As most mothers know, it's almost impossible to cook dinner with a toddler in the room. In order to distract Logan long enough for me to prepare a casserole and stick it in the oven, I dug around in the drawers and cupboards and found a bunch of things that he could play with quietly beside me. It worked too well! 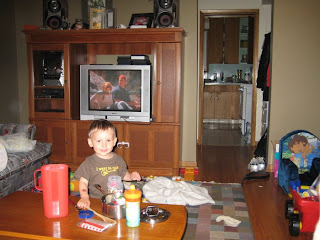 Logan took the red jug, the wooden spoons, the measuring cups, the little pot and lid, the plastic salt and pepper shaker, etc. into the living room and lined them all up on the coffee table. He then mixed in a few of his choice toys: a few blocks, some bath toys, Smurfs and a zebra in with all the cooking utensils. He's been having great fun with all this stuff for days. I've never seen him so occupied and happy to be playing by himself. He even brings the spoon up to his mommy and daddy for a "taste". He blows everything cool before we get to taste it of course. He's a very diligent chef. He sprinkles "spices" from his milk and juice sippy cup and the empty salt shaker. He stirs and adds blocks for flavour. I've even caught him playing peek a boo with the reflection in the silver pot lid. Cute! We only hope that he keeps this interest so that we will have our own personal cook in a few years. There are some excellent chefs in my family (definitely not me! ), so hopefully the trend will continue.